Description: Introducing a burger deal like no other. 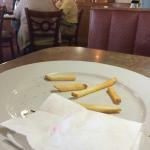 Perkins® new Burger, Fries and Pie Combo. Pick any big American specialty burger, crispy fries & your choice of famous Perkins pie, all for a classic price. It's a deal-plus-dessert that only Perkins could create! Available for a limited time at participating Perkins restaurants. Love that we can order and pick it up. a lot of food choices to choose from too. All of the Food has been really good. We went up to be with family during a surgery and stopped on the way back to our hotel for some supper. It took forever for someone to take our order at the counter then when it was ready it took them a long time to tell us the bag setting behind the counter was our to-go order. The food was mediocre and not worth the stop. We would have done better to have just grabbed a junk food hamburger somewhere but we were wanting a meal with meat and vegetables and thought we might get a good one here. Won't go again next time we are up. The place was not busy. There were at least 3 servers maybe a 4th. Yet the service here continues to be slow. Plenty of new faces same slow service. The food was good and that the only reason they did not get a poor rating. It seems that the quality of food has gone way down. It use to be to a great value and great food, but it seems that the quality is going down instead of going up. The hostess and waitress that we had left us in stitches. I wish I could remember their names. Some of the best service I have ever had at a Perkins restaurant. Thank you very much. Visited on Saturday, February 24, 2018 after 8 pm. Been to Perkins Restaurant & Bakery? Share your experiences!